The eight urban centers identified by the State Plan accounted for only 1.1 percent of the state’s total increase in population between 2000 and 2008, but accounted for 11.4 percent of the total statewide population increase from 2008 to 2011. 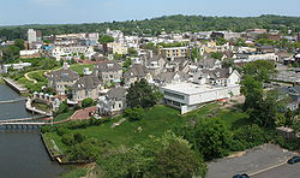 The story is similar but more dramatic for the 30 cities identified by the Housing and Community Development Network of New Jersey as “distressed” in their 2006 report Cities in Transition. As a group, the distressed cities lost population between 2000 and 2008, just as they had lost population for four decades between 1950 and 1990 before managing a modest gain in the 1990s. But between 2008 and 2011, the 30 distressed cities together posted a 2.6 percent population increase, outstripping the statewide rate (1.8 percent). The pattern is also visible in the group of municipalities that were at least 95 percent built out (that is, that have developed at least 95 percent of all of their developable land (pdf)) as of 2007 – a diverse group of big cities, smaller towns, and older suburbs. These places as a group decreased in population by 1.1 percent between 2000 and 2008 (while the state grew by 3.0 percent) but grew faster than the state between 2008 and 2011. 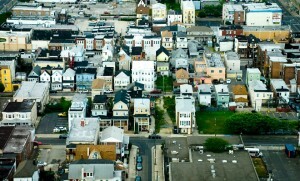 In June, New Jersey Future took a look at new 2011 county population estimates and found a dramatic reversal of the population growth patterns of the past half-century, with more heavily urbanized counties actually growing faster than counties on the suburban fringe in the wake of the housing market collapse of 2008. This month, new municipal population estimates offer an opportunity to see whether the same phenomenon is playing out at a more local level. The Census Bureau and the Associated Press have already noted the turnaround in the municipal data from the national perspective, with cities growing faster than their surroundings for the first time in decades. Is the same thing happening in New Jersey? In a word, yes. Measured any of several ways, the pattern is clear: Between 2008 and 2011, older, more urbanized, more built-out municipalities generally grew faster than less-developed suburban, exurban, and rural municipalities. Consider the eight “urban centers” defined by the State Plan – Newark, Jersey City, Paterson, Elizabeth, Trenton, Camden, New Brunswick, and Atlantic City. As a group, these cities had lost population for four decades, through 1990, and then posted a very small gain (+1.0 percent) in the 1990s (vs. 8.6 percent growth statewide). They continued to grow anemically between 2000 and 2008, increasing by 0.3 percent, compared to a 3.0 percent increase (also fairly anemic) for the state as a whole. But between 2008 and 2011, these urban centers nearly matched the statewide growth rate, growing by 1.7 percent vs. a statewide rate of 1.8 percent. These big cities had not come close to matching the statewide growth rate since before 1930. They managed this feat by gaining, on average, 17 times as many new residents annually from 2008 to 2011 as they had between 2000 and 2008. In other words, the urban centers did not simply hold steady after the recession – they actually started gaining people at a much faster rate. Just as the Census Bureau found, the “urban” rebound in New Jersey extends beyond the biggest and most identifiable cities to include built-up, densely populated places of all sizes. If we look at all 188 municipalities in New Jersey that were at least 95 percent built out as of 2007 – a mixed bag of cities big and small, older “urban” suburbs, and stand-alone small towns like Freehold, Red Bank, Hightstown, Princeton, Flemington, Riverton, or Penns Grove – we see the same loss of prominence since World War II: In 1940, these municipalities together contained two-thirds (66.4 percent) of the state’s total population, but by the time of the 2010 Census accounted for only 38.3 percent of the state total. Since 1950, these built-out municipalities have grown at a much slower rate than the state as a whole, including having actually lost population in the 1970s (-7.0 percent) and 1980s (-2.5 percent). They collectively lost population between 2000 and 2008, as well. In contrast, the 110 municipalities that were less than 50 percent built-out as of 2007 accounted for 31.8 percent of total statewide growth between 2000 and 2008 but only 7.5 percent of statewide growth from 2008 to 2011. These municipalities as a group grew by more than 3 times the statewide growth rate (10.5 percent vs. 3.0 percent) from 2000 to 2008 but grew more slowly than the state as a whole from 2008 to 2011 (1.4 percent vs. 1.8 percent statewide). It appears the retreat from the exurbs, and the concurrent rediscovery of already-built places, is playing out at the municipal level in addition to the county level. Considering that New Jersey is the most developed state in the nation, this trend toward redevelopment of already-built areas and away from continued development of a dwindling supply of open land is good news. If any state is in need of a rethinking of the dominant development paradigm – or is better poised to capitalize on the alternative – it is New Jersey. The increases in urban areas are very encouraging, but I would soften the conclusions that the cause of suburban slowdown is either demographic change or the mortgage crisis. While both of those may have played a role, it is never wise to neglect supply shortages when dealing with a state with population outflows. We got through the 1990’s and most of the last decade on the supply of higher density housing created by the Mount Laurel doctrine. There haven’t been new inclusionary developments in neary 15 years and the pipeline of market-relevant housing types in suburban areas has been dry for some time. The age conversions have helped, but few of those have broken ground with new product yet.